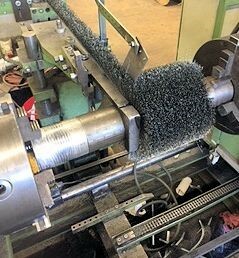 Double Band Winding System | Industrial Brush Company, Inc. 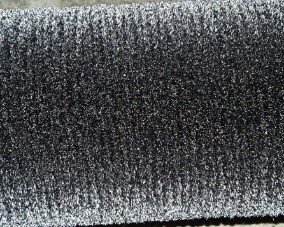 The "Double Band" winding system is used for a wide range of applications that require extremely aggressive brushing. 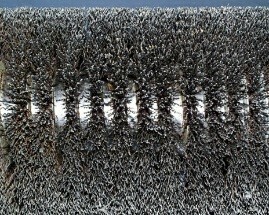 Double Band Brushes are manufactured in continuous form then wound and welded on to a metal core. Brush density is controlled by the pitch of the spiral and the amount of bristle material dropped on to the channel. At the heart of successfully captivating filaments is our "Double Band" channel construction. 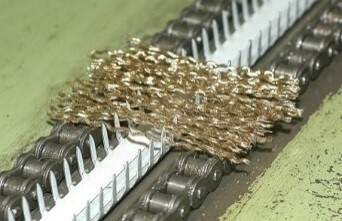 The filaments are uniformly fed on to a moving outer metal band. The outer band has individual teeth punched in it that impale the filaments. The outer band is merged with an inner band that is formed to produce a continuous strip. This winding system allows us to secure light gauge and heavy gauge carbon steel, stainless steel and brass wires in maximum densities. 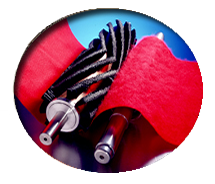 Brushes can also be made in Nylon, Antistatic Nylon, Polypropylene, Silicon Carbide, Aluminum Oxide and Ceramic Grit. If you think the Double Band Winding System suits your application requirements click on the link below to proceed further to view the different core options for your brush. Filling out one of these specification sheets will allow you to receive a timely quote.